9" X 9" 9" X 9" 9" X 9" 9" X 9" 9" X 9" 9" X 9"
Reflective Signs are die cut and screen printed using UV (Ultraviolet) inks to withstand years of outdoor use in all types of climates. These durable security yard signs hold up well in sub-zero climates or scorching desert heat. The reflective laminate is applied to .055" Polyethylene. 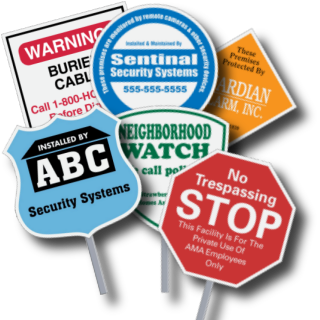 Our Custom Alarm and warning signs are available in 6 popular shapes and are commonly used for Neighborhood Watch organizations, no-trespassing signs and security alarm companies. These signs are very popular with utility companies which use them to indicate buried electrical, telephone, water and gas lines in unlit areas. Matching window stickers are on sale for the month of April starting at 9¢ each for non-reflective or 29¢ for reflective. Stakes are purchased separetly and not included in base price. All signs are available in six shapes and 32 different colors. Click on the BBB link below to see why we are the top choice for thousands of companies from small mom-and-pop to fortune 500. For almost 2 decades, deSIGNery Signs has supplied thousands of security companies and alarm companies with high quality reflective yard signs. We have maintained an A+ rating with the BBB Better Business Bureau since joining in May of 2004.